Sue Purnell is a crafter from the United Kingdom. Though Sue said that she has not been crafting long, her work is good and I love the card that she sent to me. It's a white and green Happy Birthday Card. Sue drew and cut a bodice on green card-stock and trimmed it with silver stickers. 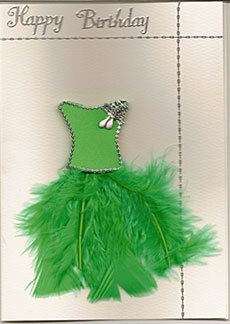 She attached green feathers for the skirt. The dress is then glued to a piece of white card-stock. More silver trimming and a silver "Happy Birthday" sticker and viola! a simple and elegant Happy Birthday card for the lucky birthday gal. Well, look at the card yourself and I'm sure you will agree with me that it's lovely.